This week has been full of ups and downs. I'm happy to have some of my family here, and I've had some really great conversations with my mom, especially related to weight loss. But it's been an interesting challenge, trying to balance my routines and my healthy lifestyle with having them around. My mom is the kind of person who will have a profound emotional discussion with you about your eating disorder, then come home with enough sweets from Chinese bakeries to feed a small army. I'm an adult and I make my choices but I'm not strong around so much temptation. I'm really happy with the fact that for the most part, I eat what I want - the difference being that now I enjoy these things within reason, and I don't keep them regularly in my house. My mom is a take-over-er (it's a word if I say it is) and went grocery shopping as soon as she got here to fill my fridge, yet hasn't cooked anything - so my house is full of triggers and things I usually try to avoid. Multiple kinds of cheese. Bread. Crackers. It's all really dangerous to me. I know better, and I still can't stop myself from mindlessly devouring a whole bag of Goldfish. I don't want it to sound like I'm totally miserable and that I'll never be able to deal with socially eating with other people ever again - going out to eat wouldn't be a huge issue, it's going out to eat several times a day for a week that gets to be a problem. Again, I'm trying to keep the maintenance point of view and make mostly good decisions but balance less-than-great choices with exercise and lots of water. It's just really interesting being more self-aware - eating like this used to be my life. One year ago, this would have been a dream trip - not only would I be able to eat unlimited junk, but I wouldn't even have to pay for it. And honestly, one year ago, it happened - when the whole family came out for my graduation. It's kind of like a saying I've heard referenced a few times by recovering alcoholics: in the end, nothing costs you more than free drinks. This week's weigh in has me at 212, a two pound loss for the week. All things considered, I'm pleased - I can show a loss while having my mom around! - but I'm a little disappointed since I saw an even lower number earlier in the week. I'm really looking forward to stability and success once I get back into my routines and regain control of my apartment. 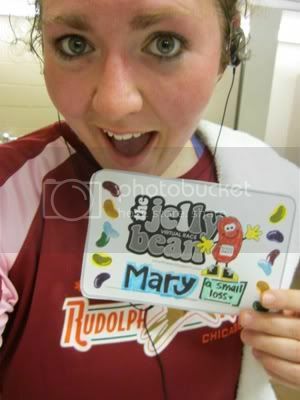 A little bit of a brag: last night I did my run for the Jelly Bean Virtual 5k, and I totally killed it: 34:26. Woo hoo! That's nearly four minutes off my 5k time from January! What about you? What do you have to brag about for this week? bravo for keepin it real hon, i KNOW family/friends don't mean to sabotage us. but the have just one little piece won't hurt you mentality WILL hurt you. i vivited one of my best friends who insisted we eat at all these foofy (YEP ITS A WORD) lol places i couldn't do. i ate bacon and scramble eggs (no toast) every day for breakfast and a chicken or shrimp cesar salad for lunch and dinner everyday and he was mad at me though i never said a word. a 2 pound loss is GREAT! Congrats on the loss. Isn't it funny/sad (mmhmm, Gary Jules) how our biggest supporters can also be our biggest saboteurs? Even when they don't mean to. What are you planning on doing with all the trigger food once they're gone? I'm just curious, because I would just throw it all out without thinking about it and I wondered what your thought was on that. I totally struggle at home with food. I turn into the snack monster...and can't stop. My parents are fairly healthy, and my mom has always been one of those people who can prepare a snack, and only eat 1/4 of a bag. I eat the whole thing, so she has some nice snacky foods around and I devoured an entire bag of riceworks last night. Not as bad as chips...but nobody needs a whole bag. They are also juice drinkers, and my worst enemy is liquid calories... I just don't keep this kind of stuff in my apartment because I'll eat it in one go. I definitely terrified to even go near a scale. I'm so glad you were able to conquer the family visit and record a loss!! ugh, I hear you on the fridge suddenly being stocked. My mother-in-law is famous for coming in to town, buying a crazy amount of groceries...and she always seems to forget that she doesn't cook. So not only is it up to Brad and I to cook the food they bring, but clean up all the mess...not to mention all the food left behind. Great picture and post. I think you've done remarkably well in dealing with a situation which presented many obstacles to your continuing healthy ways. AND a loss at the end of the week. Congrats! Congrats on your 5k time. I also feel the same way with family and friends - although I am an adult and can make my own choices, don't make this any more difficult for me! Thanks for a great post today. Congrats on your loss, and on your 5K time! That's awesome! Yeah! and ALL counts in this post! Keep it up..
Congratulations! Sounds you are keeping yourself on target.. Tell your mom she doesnt live and to stop taking over. Tell her you NEED her to be supportive.